When we talk about crime and elderly people it’s usually in the context of the victim. However, pension age people are increasingly being linked with crime as the perpetrators – a rise of over 50% since 2011. Jokingly dubbed ‘Saga louts’, their crimes are far from funny: theft, burglary, drug supply, harassment, fraud and carrying weapons. Many believe that one of the primary root causes of this increase is the rise in poverty among the elderly, with fewer of them able to make ends meet. Age UK has reported a big increase in the number of elderly people seeking welfare advice and being directed to food banks. Most pensioners are on fixed incomes yet their cost of living continues to rise and at that age their options to increase their income are much more limited than they are for younger people such as taking on extra work or borrowing money. There are therefore many more older people who are simply desperate. 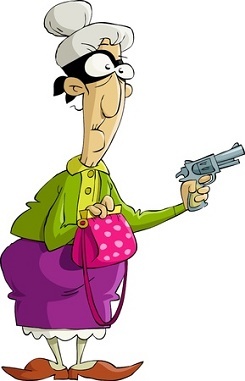 Theft is the number one crime being committed in this 65+ age bracket which could support this theory. At the other end of the scale, it’s also been reported that police have felt the collars of children as young as 4 for assault and criminal damage and that crimes including burglary, theft and shoplifting are being perpetrated by children who legally can’t be charged due to being below the age of criminal responsibility which is 10 years old. What this shows is that we can’t make assumptions about the kind of people who may pose a risk to our home security; not all burglars are 20-something men so we should use the same sensible precautions with anyone hanging around our homes or coming to the door. That’s not to say we should be suspicious of everyone, just that you consistently apply your security precautions with anyone you don’t know – regardless of age – such as not letting strangers into the house, not allowing yourself to be distracted by someone at the door and not leaving back doors unlocked if someone knocks at the front. Don’t forget of course that these criminals at either end of the age spectrum may well trade on the fact that their age is less likely to raise suspicion, so just be aware. previous It’s our 40th anniversary this year. And our 10th! next Are you in a burglary hotspot?